This year, Friday 23 November is White Ribbon Day. 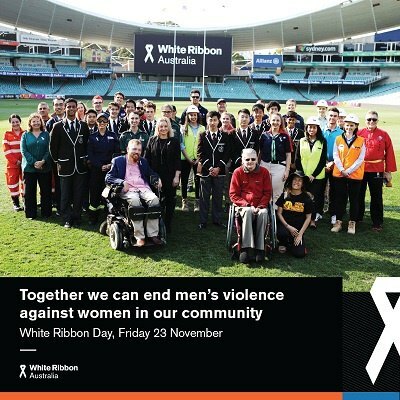 White Ribbon is Australia's campaign to prevent men's violence against women. Held annually, White Ribbon Day is an opportunity to raise awareness of the prevalence and devastating effect of domestic, family and sexual violence. Domestic, family and sexual violence affects the lives of far too many people in Australia, with one in three women having experienced physical and/or sexual violence perpetrated by someone known to them. This White Ribbon Day, men are encouraged to take the White Ribbon Oath and make a difference by swearing to stand up, speak out and act to prevent men’s violence against women. Everyone can get involved by holding or attending a White Ribbon event and donating to support violence prevention initiatives in schools, workplaces and the broader community. The SA government is committed to addressing violence against women, and has invested more than $11.9 million over the next four years on a suite of measures to support women and children at risk in South Australia. SA Department of Human Services male executives shared their commitment to ending violence against women in a short Facebook video.